Built in 1926, the Benjamin Franklin Bridge (previously the Delaware River Bridge) is one of the largest suspension bridges in the world. The structure spans the Delaware River and connects Philadelphia's Center City with Camden City in New Jersey. When the bridge was built there were plans for a trolley line to run alongside the bridge's automobile and pedestrian levels. However, as rail travel declined, buses became more popular modes of transportation and the trolley line was never opened. 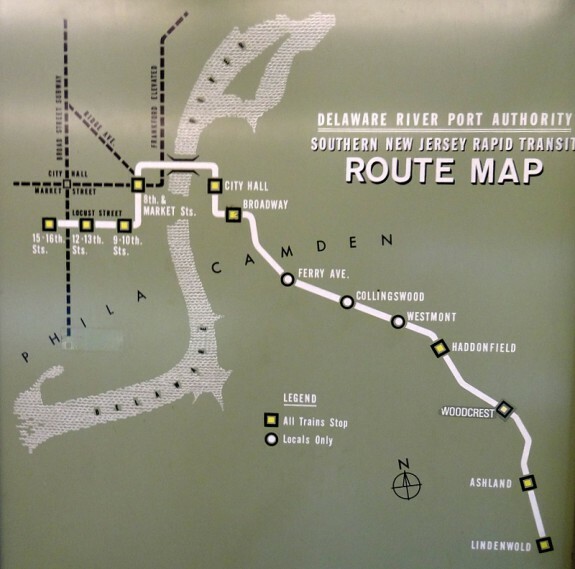 When the Delaware River Port Authority's PATCO line opened in 1969, trains used a revamped adaptation of the trolley line to carry passengers across the river. 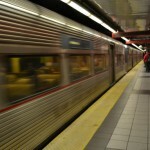 In the twenty-first century, high gas prices, high tolls, and heavy traffic have made mass transit a preferable mode of transportation for many commuters from both states. This is the PATCO route map as it appears on board the line's cars. To ride the full length of the line takes about half an hour for passengers who board in Lindenwold, New Jersey, and go to the other terminus at Fifteenth-Sixteenth Streets in downtown Philadelphia. 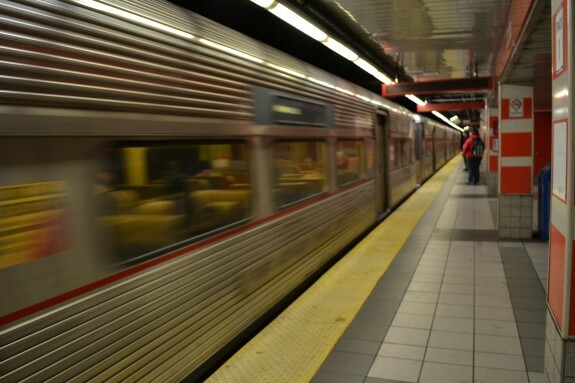 The Port Authority Transit Corporation (PATCO) Speedline combined two sets of underutilized transit infrastructure to create a groundbreaking model for regional passenger transportation when it opened in 1969. It was one of Greater Philadelphia’s major public transportation successes of the mid twentieth century. In the early twentieth-first century, however, PATCO struggled to maintain both the infrastructure and relevance of the high-speed rail line from Center City Philadelphia and Camden to Lindenwold in suburban Camden County, New Jersey. The earliest roots of the PATCO Speedline trace back to the passenger services of the Philadelphia region’s two dominant railroads, the Pennsylvania and the Reading. In the late nineteenth century, both systems ran extensive commuter rail operation in southern New Jersey radiating from Camden with ferry connections to Philadelphia. Many communities, such as Haddonfield, became early railroad suburbs. By the early twentieth century, however, the railroads began to cut back on this service because of competition from streetcars, buses, and automobiles. The completion of what is now known as the Benjamin Franklin Bridge in 1926 sped this decline. The railroads reacted by discontinuing more trains and, eventually in 1933, merging their southern New Jersey systems into one jointly owned company. Despite this combination, commuter train service continued to falter. The other key portion of what became PATCO was the Bridge Line, a subway that ran between Eighth and Market Streets in Philadelphia and central Camden (crossing over the bridge). Opened in 1936 by a predecessor of the Delaware River Port Authority, the line was owned by the bridge authority but operated initially by Philadelphia Rapid Transit (and later the Philadelphia Transportation Company). In 1951, the long-delayed Locust Street subway in Philadelphia opened and was integrated into the Camden line. The Bridge Line operated well under capacity for most of its independent existence. In 1951, Pennsylvania and New Jersey created the Delaware River Port Authority, and among its charges was the creation of an integrated passenger rail system serving Philadelphia and its New Jersey suburbs. 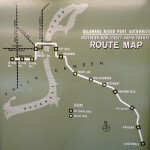 Initially the PATCO system was to consist of three lines with a new tunnel under the Delaware River, but by the 1960s the decision was made to construct only one of those lines and incorporate the existing Philadelphia to Camden subway into the system; both were cost-savings measures. The route from Camden to Lindenwold was built on the right-of-way of the railroad to Atlantic City (which had been one of the region’s earliest commuter lines). Opened in 1969, the PATCO Speedline was an immediate success. It was also a model of transit innovation: The trains were among the first to be operated by computer, the line used an innovative advanced fare collections system, and all suburban stations incorporated park-and-ride facilities or coordinated local bus connections. Initially carrying 21,000 riders daily, by the early twenty-first century the number had increased to 38,000. New stations and additional rail cars subsequently allowed ridership to increase. 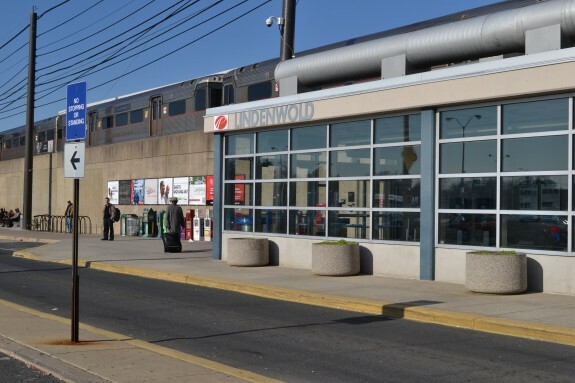 Although most development in southern New Jersey followed the highway system during this period, the PATCO Speedline contributed to the region’s economic growth in two key ways. 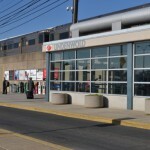 The park-and-ride lots drew suburban commuters from a broad area around the line, and the coordinated rail-bus schedules served both traditional and reverse commuters in the region. 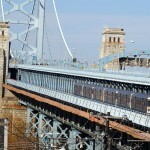 Despite this success and various studies advocating either the extension of the existing line or the construction of one of the other proposed spurs, the PATCO Speedline has not expanded, largely due to high construction costs and local opposition. The next addition to local rail transportation in southern New Jersey, the River Line, opened in 2004, was not designed to coordinate well with the PATCO system. In the early twenty-first century, PATCO struggled to maintain its equipment and stations and faced decreasing rider satisfaction. John Hepp is Associate Professor of History and co-chair of the Division of Global History and Languages at Wilkes University in Wilkes-Barre, Pennsylvania. He teaches American urban and cultural history with an emphasis on the period 1800 to 1940. Hepp IV, John H. The Middle-Class City: Transforming Space and Time in Philadelphia, 1876-1926. Philadelphia: University of Pennsylvania Press, 2003. Kramer, Frederick A. Pennsylvania-Reading Seashore Lines: An Illustrated History of South Jersey’s Jointly-Owned Railroad. Ambler, Pennsylvania: Crusader Press, 1980. Williams, Gerry. 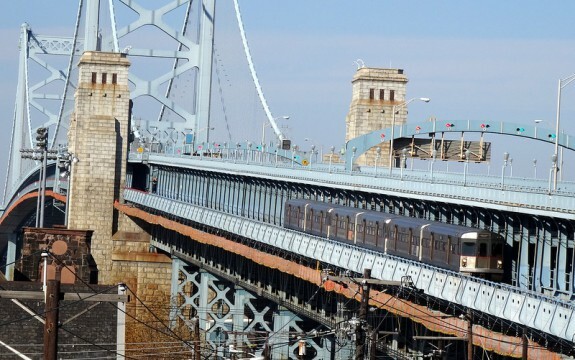 Trains, Trolleys & Transit: A Guide to Philadelphia Area Rail Transit. Greentown, Pa.: Railpace, 1998. Local history room, Collingswood Free Public Library, 771 Haddon Avenue, Collingswood, N.J.
Local history room, Haddonfield Public Library, 60 N. Haddon Avenue, Haddonfield, N.J.
Map Collection and Print and Picture Collection, Free Library of Philadelphia, 1901 Vine Street, Philadelphia. PATCO Speedline stations, Philadelphia and South Jersey.